Western blot analysis of extracts from SK-MEL-28 and C2C12 cells, untreated (-) or treated with insulin (100 nM, 15 min; +), using Phospho-S6 Ribosomal Protein (Ser235/236) (E2R1O) Mouse mAb (upper) and S6 Ribosomal Protein (54D2) Mouse mAb #2317 (lower). 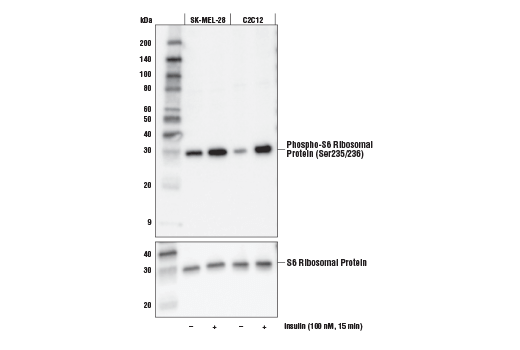 Western blot analysis of extracts from SK-MEL-28 cells, untreated (-) or treated with λ-phosphatase (+), using Phospho-S6 Ribosomal Protein (Ser235/236) (E2R1O) Mouse mAb (upper) and S6 Ribosomal Protein (54D2) Mouse mAb #2317 (lower). 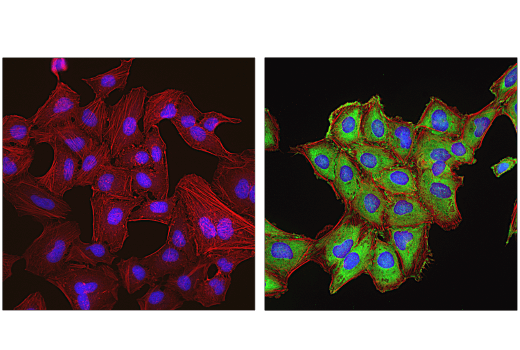 Confocal immunofluorescent analysis of HeLa cells, serum-starved overnight and then treated with Rapamycin #9904 (100 nM, 2 hr; left) or FBS (20%, 30 min; right), using Phospho-S6 Ribosomal Protein (Ser235/236) (E2R1O) Mouse mAb (green). Actin filaments were labeled with DyLight™ 650 Phalloidin #12956 (red). Blue = DAPI #4083 (fluorescent DNA dye). 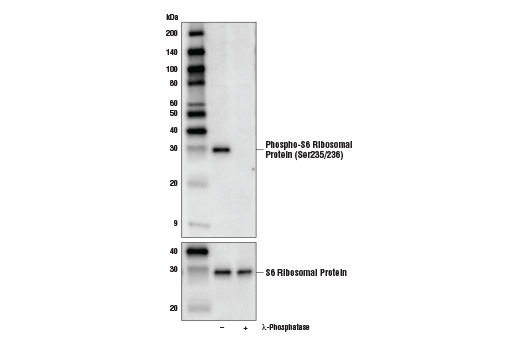 Phospho-S6 Ribosomal Protein (Ser235/236) (E2R1O) Mouse mAb detects endogenous levels of S6 ribosomal protein only when phosphorylated at Ser235 and Ser236. Monoclonal antibody is produced by immunizing animals with a synthetic phosphopeptide corresponding to residues surrounding Ser235 and Ser236 of human S6 ribosomal protein.